The goals: restore the patient’s individual spine geometry and avoid the risk of adjacent degeneration. The primary goal of spine surgery is to enable the patient to be mobile and permanently free of pain up to a ripe old age. In order to optimally treat the diseased segment, the surgeon needs to restore the individual geometry of the spine as best he can. vertaplan enables you to plan the surgical procedure with software assistance, to precisely align the spine geometry and thus restore the individual movement profile of the patient. The solution: optimum planning of the surgical procedure and precise alignment of the spine geometry. Based on X-ray images, the software calculates the optimum adjustment of the patient's spine geometry to the exact angle and millimeter, taking into account the patient's individual movement parameters. Integrated measurement functions that take the sagittal balance into account enable you to make conclusions about individual deviations from the spine balance when compared with statistical standard values. The software measures the vertebrae and the intervertebral disc spaces and automatically suggests which implant is the most suitable for the patient in question. It also calculates what effect the correction will have on the neighboring segments and the overall geometry of the spine. Thanks to this precise planning, we can dispense with some of the X-ray checks that are otherwise standard during surgery, which means reduced radiation exposure for the patient. With the vertaplan software the patient's individual anatomy can be better factored in and surgery can be planned and performed more precisely, so that the long-lasting success of the surgical procedure is more likely than with conventional methods. The preoperative planning can be clearly demonstrated to the patient, which helps the patient understand the therapeutic measures, thus reinforcing his/her motivation. During surgery, the software assists the surgeon by enabling adjustment of the spine geometry to the exact angle and millimeter and by monitoring the effect of the correction on the overall geometry of the spine. Thanks to this precise planning, we can dispense with some of the X-ray checks that are otherwise standard during surgery, which means reduced radiation exposure for the patient. A report of all calculation and planning data is automatically generated in PDF format. This can be printed out for documentation purposes and filed with the patient’s records. You can make impressive presentations to colleagues and students. The software enables the surgeon to plan the operation precisely in advance and to simulate the outcome of the operation. You can perform the planning at any time, even sitting at your desk, and integrate it into a medical report. Furthermore, the vertaplan software can be used to evaluate the preoperative planning after surgery. Therefore, it can - for the first time ever - be used for individual and systematic quality assurance of the outcome in routine care. 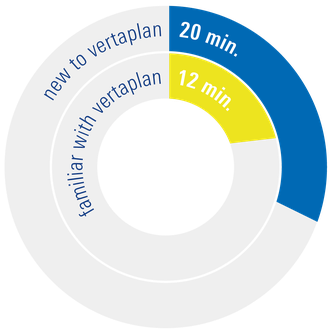 What does vertaplan contribute to your confidence and to optimum patient care? Quality of outcome supported by an improved preoperative OP planning process. The software significantly simplifies the systematic planning, thus facilitating fast, reliable implementation in the daily work routine. These planning processes are not only more stable and hence less error-prone, but they also save time in comparison to previous methods. In order to organize the complex procedures in daily hospital routine simply and reliably for the user, the vertaplan software provides a central data base with an interface to the PACS1 archives of global manufacturers. 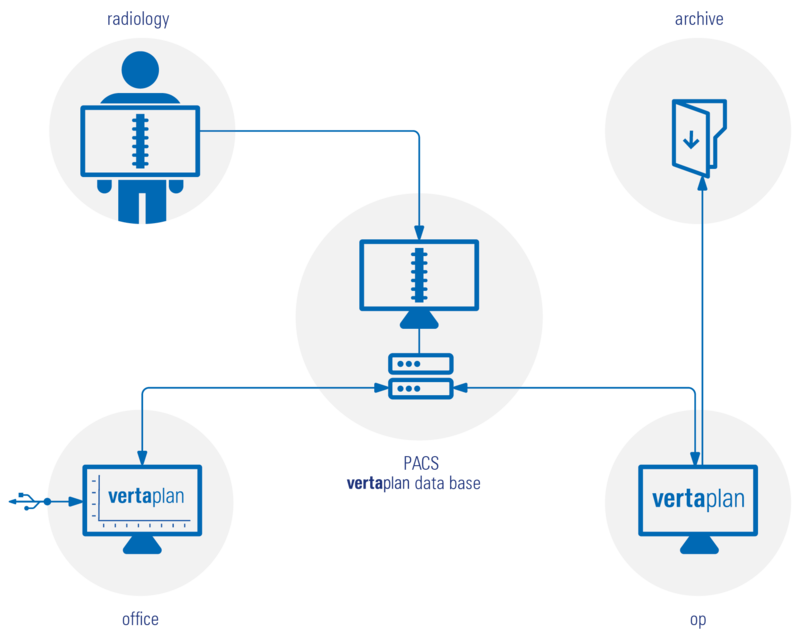 vertaplan enables the import of DICOM X-rays2 via the vertaplan workstation. The interface can be flexibly integrated into the existing clinical information system infrastructure and is available for all vertaplan workstations, based on the specific needs. The result of the optimized image communication means enhanced and faster patient care in your hospital. You see at a glance where a patient’s data is available and at what planning stage you are. The state-of-the-art image data management guarantees a continuous workflow from data import right through to a digital report of the planning, which can be printed out at the end. In addition, DICOM images can still be uploaded manually from external data media (e.g. CD or USB flash drive). This means that preoperative planning can be performed at any time even without a network connection. 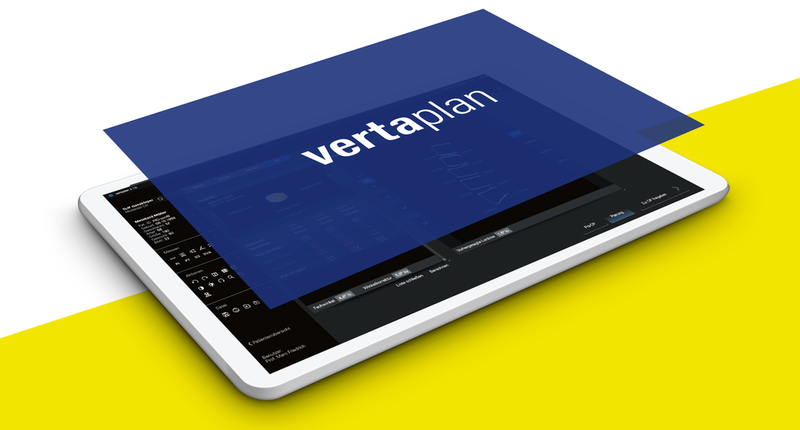 vertaplan runs on various operating systems such as Windows, Apple Mac OS and Linux and is available in various languages. Computer-assisted planning is becoming more and more routine in spine surgery. It helps the surgeon achieve more certainty, economic efficiency and better surgical outcomes. 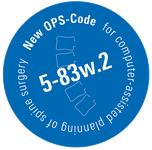 With the new OPS 5-83w.2 computer-assisted planning can now also be coded.